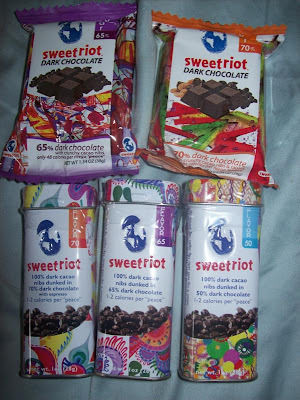 After seeing this Sweetriot product on HungryGirl, I was lucky enough to get to try it for myself for a review on my blog. They are 100% dark cacao nibs dunked in chocolate! I tried them and they are delicious! They are very small pieces which I think is good for portion control. They also have great nutrition facts. Giveaway: Sweet Riot will be giving away this same prize pack of chocolate that you see here to one lucky winner! The giveaway is open until Midnight on Thursday August 19th. Winner will be chosen on Friday August 20th using Random.org. Mandatory: Tell me your favorite kind of chocolate! -Like Sweet Riot on Facebook (1 entry). -Add Sweet Riot to your Twitter (1 entry). Ester Price chocolate is THE best! I found your blog thru another blog! I make my own chocolate goodies now though. I just melt and sweeten bakers chocolate and then dip all kinds of fruit, nuts, coffee beans, ect in the chocolate!! I found your site after you commented on my blog! I am entered in the salt giveaway! Just wanted to say THANK YOU for participating in this week's WELCOME WEDNESDAY Blog Hop! We hope to see you weekly! We are so happy to be following your blog and can't wait to read more! You can help spread the word about our great event by grabbing our button! HERSHEY'S is the best chocolate. actually i can eat any and all chocolates. i'm a chocoholic. i was on the facebook swagbucks page and saw your comment about your site. My fav kind of chocolate is anything with hazelnuts! dark dark dark chocolate : ) YUMMMM! I absolutely love the Ghirardellhi dark chocolate squares filled with caramel. OMG it's ABSOLUTELY delicious!!! HI! I found your site because you found me! Thanks for visiting Momondealz, I am your newest follower! I do not see if we Canadians are OK or not on this on, if not leave me out... My favorite chocolate, well all of it LOL but if I had to narrow it down right now (it changes) it would be the Purdy's salted caramel (milk) I just love that just one is perfect. My daughter is a HUGE dark Chocolate fan and would LOVE this prize! I enjoy dark and milk chocolate and any kind of chocolate with peanut butter. I found your blog through another blog! I follow SR on Facebook. I follow SR on Twitter. I found out about your blog from TMB Racing with babes blog. My favorite kind of chocolate is just a milk chocolate bar- like Hershey's. I like it plain and simple. My favorite kind of chocolate is bittersweet! I found you on Wednesday Blog Hop! I entered your beyond the salt gourmet saltshaker giveaway! I also entered the mangroomer giveaway. I love Hershey Chocolate...Hershey with Almonds is my favorite! Thanks! I found your blog through 'Mediterranean Snacks' site on Facebook. My faveourite chocolate is Cocoa Camino's Dark chocolate with almonds! My fave kind of chocolate is anything dark because it has less sugar in it. I found you from Amundsen House of Chaos. ENtered your •Cafe Don Pablo Coffee giveaway. I entered your •Mediterranean Snack Food Company Baked Lentil Chips giveaway. I've never met a chocolate I didn't like, but I think Fannie May is at the top of the list! My fave chocolate brand is Dagoba Organic, with nibs.